Poggio Scalette takes its name from the landscape, which is characterized by dry, stone walls supporting terraces on which the vineyards and olive groves are planted. From a distance the impression is of a series of stairs climbing the slopes of Greve. 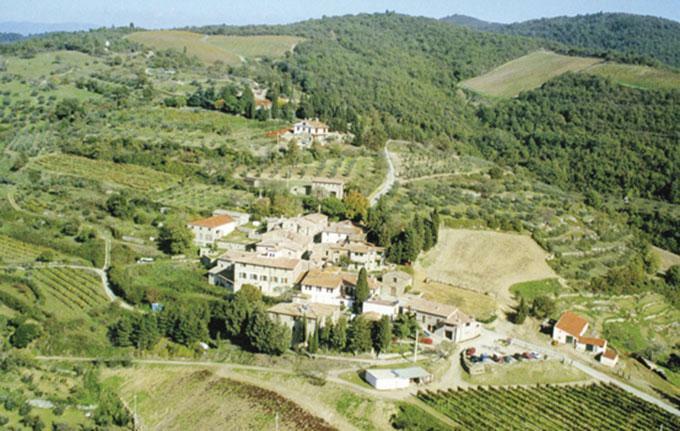 After the death of its previous owner, Poggio Scalette remained abandoned for years until Vittorio Fiore, one of Italy's most famed winemakers, discovered the property in 1991 with his wife, Adriana. In 1996, 42 additional acres of land became available, enabling them to expand. It was discovered that the plot of land known as Il Carbonaione was the first area to be replanted after World War I (1914-1918), which means these vines, more than 90 years old, are a rare example of the original clone of the famous Sangiovese di Lamole variety in the Chianti Classico area. A wine which is the maximum expression of its territory and of the grape varieties which compose its blend: first and foremost the Sangiovese of Ruffoli, the magic Chianti Classico hillside in Greve in Chianti. Its forte is the freshness of its aromas and the sheer drinking pleasure which it offers. Wine Spectator 88A fruity style, this delivers cherry, plum and earth flavors, with accents of tobacco and mineral. Firms up on the moderately long finish. Drink now through 2024. Vinous Media 88"The 2014 Chianti Classico is bold, super-ripe and racy to the core. Black cherry, plum, spice and mint all race across the palate. This is an unusually concentrated wine for the year." Robert Parker 94"It bursts from the glass with layers of deeply spiced, mentholated fruit. Sweet and expansive on the palate, this powerful, dense wine offers superb balance. Today the tannins are somewhat imposing, so further bottle age seems prudent. Anticipated maturity: 2014-2024."